The magazine thus included a two-page map – attempting to answer these larger cultural and evolutionary questions via cartography. [Image: A map of possible human migration routes out of Africa and the Middle East; via New Scientist]. But how did humans spread? Skeletal remains from Skhul and Qafzeh in Israel dating from 120,000 to 90,000 years ago are the oldest known traces of modern humans outside Africa… However, all evidence of human habitation beyond Africa disappears around 90,000 years ago, only to emerge again much later. What happened later is the subject of the article – which goes on to encompass “signature” mutations, southern routes and northern routes out of Africa, “the gene associated with language,” the colonization of Australia, bone-bearing caves on the coast of Sri Lanka, and so on. But it’s the map, I think, that tells the story so clearly. My only major problem with it is that it shows the world as it looks today, with sea levels where they stand in the present. However, as we only just read, global sea levels were at least 100 meters (or 328 feet) lower back then, because so much water had been frozen into continent-spanning glaciers. Accordingly, the continents would have had very different outlines. Sri Lanka was not an island, for instance, but a peninsula connected to India, and many, many hundreds of smaller islands throughout Indonesia were actually connected into one large landmass. [Image: A map of southeast Asia during the Ice Age; note how much dry land there could have been. This certainly isn’t the greatest map in the world; it’s just all I could find – and it comes from a site claiming that this somehow proves Atlantis was real…]. Looking at a more accurate Ice Age geography, in other words, would make it substantially easier to comprehend how humans spread, for the most part on foot, to places as far away as central Australia. In fact, I’d go as far as to suggest that, until you look at the world as it was back then, with lower sea levels, you will only mis-theorize these migration routes, devising ever more elaborate forms of seafaring and stellar navigation when it might simply have been the case that they walked. In any case, ancient human migrations just blow me away. What was it like, standing there on the sandy coasts of Iran or Saudi Arabia, 55,000 years ago? Walking around in the growing darkness as evening sets in, looking up at the stars, building fires – perhaps even dreaming of future towers on the very site where Dubai now rises. A map of Ice Age coastal lines could not be enough. You should go a little bit further in your reasoning: are we sure the coasts of Iran and Saudi Arabia were “sandy”? The article already states that Sahara had many different “wet periods”, and there’s clearly a link between those climate changes and migrations. What trips me out is the strong link between indegenous people of the Asian mainland like China with native Americans of North and South Americas. You can still see the influence of Asians in the features of a lot Native Americans today. We have nice names for these past continents: Pleistocene southeast Asia is Sunda, and Pleistocene Australia/PNG is Sahul. At times the latter even had a gigantic lake which goes by the name of Lake Carpentaria. People did need to travel by sea to get from Sunda to Sahul though – the Wallace sea always had water gaps, even at the time of lowest sea levels. More importantly the dates of human migration pulses do not match up with the periods of lowest sea levels, so this indicates that people were will to take to the water. Australia and PNG have Pleistocene sites dating to at least 45,000 years ago – earlier than Europe. I was going to add that if you look at ice age coastlines, you should also look at the ice age glaciers. Surely they were equal barriers to migration. But as suggested in the comment above, we really need to take into account all the dynamic (and cyclic) landform changes over the period in question. I am much reminded of the book Guns, Germs, and Steel which looked at human migrations and the factors which might have influenced them. Surely some scientist out there has put these ideas together in a map form: glacial movement, sea levels, tectonic plate movement, known dated humany remains. And now I’d really really like to look at it. Are there any major distinctions that would need made? I liked the idea of wondering if Dubai would have been a desert at the time too, I just couldn’t figure out the succinct way to put it. While I’m wishing, I also wish there were more places like this. Places that have good, clean, informational wall posters. I’ve found a couple, but they’re so often pricey and too often made to appeal to 5 yr olds. I found this… http://merkel.zoneo.net/Topo/Applet/ hope it’s something that you might find interesting. The inevitable rising sea levels make me think of those Venetian temporary walkways. London will probably need a Rialto Bridge eventually, but on the scale of the Brooklyn Bridge. I was always hoping skyscrapers would make sense in London eventually. What I also find very interesting are the totems, ceremonial motifs of the ancient northern China plains and those by the people of Aztec and Mayan civilizations. 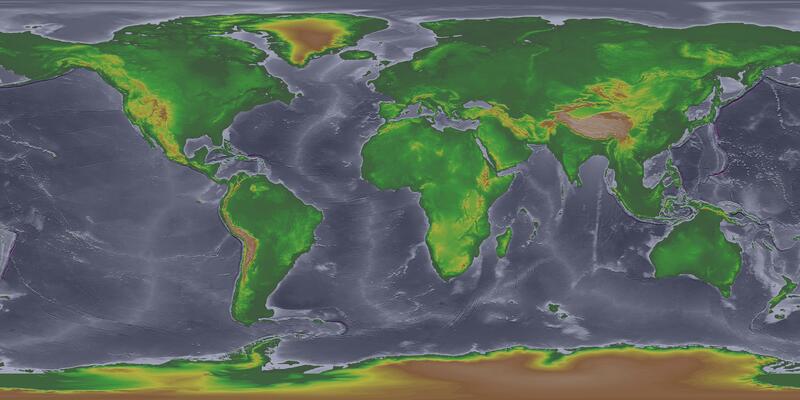 Some attempts at "more precise" modeling of terrain during the last icea age – including sea level of the time.